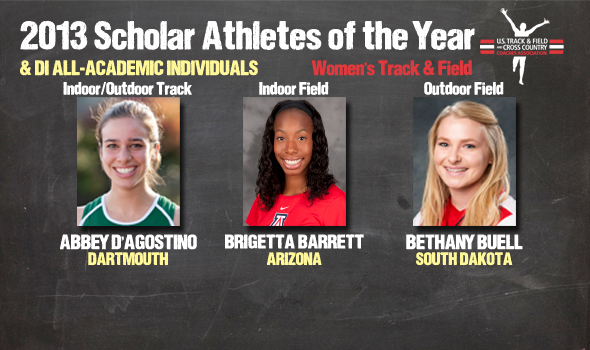 NEW ORLEANS – Abbey D’Agostino of Dartmouth, Brigetta Barrett of Arizona and Bethany Buell of South Dakota have been named the Scholar Athletes of the Year in Division I for the 2013 women’s track & field seasons by the U.S. Track & Field and Cross Country Coaches Association (USTFCCCA), the association announced Wednesday. These three women’s combination of academic and athletic achievement was exceptional among a group of 710 women who earned USTFCCCA All-Academic distinctions. The full breakdown of All-Academic selections can be found below. D’Agostino, a junior psychology major with a cumulative grade point average of 3.69, is the first woman in Division I to sweep the indoor and outdoor track Scholar Athlete of the Year awards since the award’s inception in 2008. These two awards brings her career track total to three, with another in cross country this past fall. The last Division I student-athlete to sweep the award for all three seasons was 2009-10 when David McNeill of Northern Arizona did so. Oregon’s Galen Rupp accomplished the feat the previous season. Not only did the Topsfield, Mass., native sweep the Scholar Athlete of the Year awards, but she also won every NCAA individual track & field event she entered this season with titles indoors at 3000 and 5000 meters and outdoors at 5000 meters. For the third consecutive year the indoor field Scholar Athlete of the Year award went to Barrett, a senior theater arts major with a cumulative 3.543 GPA. She is the first Division I woman to earn Scholar Athlete of the Year distinctions — either indoors or out, track or field — in three consecutive years. The Wappingers Falls native’s indoor campaign culminated with her third-straight NCAA Division I Indoor Track & Field Championships high jump title, and she is a finalist for The Bowerman for the second consecutive year. The outdoor field Scholar Athlete of the Year award went to Buell, a junior psychology major with a 3.97 cumulative GPA. The native of St. Louis, Mo., became South Dakota’s first Division I national champion when she claimed the pole vault title at the Division I Outdoor Track & Field Championships. Including the Scholar Athletes of the Year, a total of 710 women from 187 institutions earned USTFCCCA All-Academic honors for their combined efforts in competition and in the classroom. Duke garnered the most All-Academic individual nods with 14, followed by both Stanford and Arkansas with 13 apiece. Minnesota earned 12 honors, with three other teams tied at 11 to round out the top five. The Big Ten topped the conference competition with 76 All-Academic individuals, narrowly edging out the SEC with 71 and the Pac-12 with 66.